Comprehensive Restorative & Esthetic Dentistry :: Derek H. Wall, DDS, PA.
What Are My Options For Repairing A Chipped Front Tooth? Approximately nine out of every 10 American adults over the age of 30 suffer from at least some level of tooth decay. While tooth decay can be treated by a dentist and prevented with proper dental care, tooth decay can sometimes cause a person’s teeth to chip. This is because tooth decay can weaken the tooth thereby making it easier to chip. While a small chip may not necessarily cause a medical issue as long as you’re being taken care of by a professional dentist, a chipped tooth can sometimes be a cosmetic concern. Fortunately, cosmetic dentistry can provide you with a couple of options to help give you back the appearance of a non-chipped tooth. Veneers can help to correct the appearance of your chipped tooth by placing a porcelain cover over the tooth. The veneer is shaped to fit your tooth and then adhered to the tooth during the procedure using ultraviolet light. While veneers do a great job at giving the appearance and functionality of a great smile, a small amount of enamel will need to be removed in order to adhere the veneers. Therefore, you may not be able to receive veneers if your dentist has determined your teeth or gums are too unhealthy. Teeth bonding is another option if the tooth you’ve chipped is visible when you smile. Bonding is when a tooth-colored composite resin is used to cover the area of the tooth where the chip is visible. Similar to a veneer, the resin is adhered to the tooth using ultraviolet light. The dentist will then shape and polish the area to ensure there are no rough edges and that the resin is natural looking. The teeth bonding procedure typically lasts between 30 to 60 minutes per tooth. 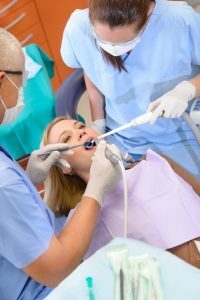 Additionally, less enamel needs to be removed for this procedure compared to veneers and so your dentist may be more likely to approve you for this procedure. If you’ve chipped a tooth in the past, dental veneers may be one of the best cosmetic dentistry options for you. For more information on dental veneers and other cosmetic dental procedures, contact Dr. Derek Wall today to make an appointment.